The external quantum efficiency for photocurrent, usually expressed as a percentage, is the number of electrons flowing per second in the external circuit of a solar cell divided by the number of photons per second of a specific energy (or wavelength) that enter the solar cell. None of the solar cells to date exhibit external photocurrent quantum efficiencies above 100 percent at any wavelength in the solar spectrum. The external quantum efficiency reached a peak value of 114 percent. The newly reported work marks a promising step toward developing Next Generation Solar Cells for both solar electricity and solar fuels that will be competitive with, or perhaps less costly than, energy from fossil or nuclear fuels. A paper on the breakthrough appears in the Dec. 16 issue of Science Magazine. Titled "Peak External Photocurrent Quantum Efficiency Exceeding 100 percent via MEG in a Quantum Dot Solar Cell," it is co-authored by NREL scientists Octavi E. Semonin, Joseph M. Luther, Sukgeun Choi, Hsiang-Yu Chen, Jianbo Gao, Arthur J. Nozikand Matthew C. Beard. The research was supported by the Center for Advanced Solar Photophysics, an Energy Frontier Research Center funded by the DOE Office of Science, Office of Basic Energy Sciences. Semonin and Nozik are also affiliated with the University of Colorado at Boulder. We believe that system owners and installers should take an active role in understanding how their system is performing and that basic web based monitoring should be free and flexible. Adhering to this philosophy, we have designed the ZigBee based monitoring solution for the PV Powered HE string inverter to make string inverter performance monitoring fast, easy, simple, reliable and flexible. Warren Buffett's MidAmerican Energy Holdings made its second foray into solar energy in as many weeks, saying on Friday it will buy a 49 percent stake in an Arizona power plant from NRG Energy Inc (NRG.N). MidAmerican, the utility affiliate of Buffett's holding company Berkshire Hathaway Inc (BRKa.N), said it will take a stake in the 290-megawatt Agua Caliente project in Yuma County, Arizona. The plant is being built by solar power company First Solar Inc (FSLR.O) and is supported by a $967 million loan guarantee from the U.S. Department of Energy. The announcement comes a little over a week after MidAmerican said it would buy First Solar's 550 MW Topaz Solar Farm power plant in California. Shares in solar power company First Solar fell over 20% in early trading Wednesday after the firm lowered its sales forecast for 2011. The Arizona-based company, which is a leading maker of thin-film solar panels and also a developer of solar power projects, predicted net sales in 2011 of $2.8 to $2.9 billion. That's down from earlier projections of $3.0 to $3.3 billion. The company said the lower sales were due to delays in its projects caused by weather and "other factors," but predicted a healthy 2012. "Our diverse business model and robust project pipeline will help First Solar generate a significant amount of cash in 2012 while improving operational efficiencies," Mike Ahearn, Chairman and Interim CEO of First Solar, said in a statement Wednesday. While energy from wind turbines currently accounts for less than one percent of total power generated in Japan, the new breakthrough in design provides ample reason to ramp up production. Called the 'Windlens,' Yuji Ohya, a professor of renewable energy dynamics and applied mechanics, and his team at Kyushu University have created a series of turbines that could make the cost of wind power less than coal and nuclear energy. The two major concerning issues with traditional turbines have been their general inefficiency and intolerable noise. However, Kyushu's researchers found that attaching an inward curving ring around the perimeter of a turbine's blades increases the focus of airflow faster through the blade zones at two to three times the speed as before. An improvement in safety from covering the outer edges of the blades and a reduction of the dreaded noise pollution of older models is just a bonus. The agreement by investor Warren Buffett's MidAmerican Energy Holdings to buy a $2-billion photovoltaic farm in San Luis Obispo County could bring a ray of financial sunshine to the battered solar-energy industry. The scale of Buffett's foray into this sector of the renewable energy scene is considerably more modest than his $34-billion purchase of BNSF Railway, but it could provide the same kind of boost to the solar power business that the 2009 acquisition did to the railroad industry, experts said. "In a lot of ways, this is classic Warren Buffett," said Bruce Bullock, executive director of the Maguire Energy Institute at Southern Methodist University. "He comes into an industry that is starving for capital investment. At the same time, this is something that also tells people it's time to take solar power seriously." THE sight of electric cars umbilically attached to their charging stations hasn't yet become commonplace. But already the technology is about to be superseded. Nissan in Japan has given a glimpse of the very near future in the form of a wireless charging station for its Leaf electric car. Present electric vehicle charging technology requires the connection of a cable to the vehicle to recharge its battery via mains electricity. Now Nissan has developed a wireless charging pad that recharges the battery simply by parking the vehicle on top of a ground transmission unit. Much like the charging system on electric toothbrushes, the Nissan wireless charger works by electromagnetic induction. Electricity is drawn from the recharging coil in a housing mounted on a garage floor and into contacts inside the vehicle. Charging your EV is something you never have to think about. 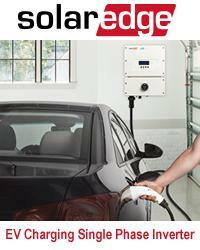 You simply drive into the garage at night, park squarely over the charging pad, and leave the car to charge itself. By morning the car is fully charged and you're on your way. The system is 90 per cent as efficient in power transmission as a cable system, meaning it will charge the car in about eight hours. Belkin this month released perhaps the simplest way to cut that standby power with its Conserve Power Switch. The small gadget is just a switch in a handy format that cuts the flow of power to anything that plugs into it. There's not much to this device, but that's its appeal. The Power Switch, which costs $6.99, plugs into a regular outlet and you plug a device into that. When you want to use your coffee machine, flick it on and a small green light turns on to indicate the plug is live. Could this simple act actually be worth it? Depending on what power source you intend to cut off, this little gadget or one like it can pay for itself in less than a year. Lawrence Berkeley National Laboratory calculates that the average coffee maker uses 12 watts when it's off. That means if you only turned it on for the few minutes that it's actually making coffee, you'd save about $12 a year based on the national average electricity price. A grid-interactive PV system implies that a PV system is tied to the grid but can stand alone if the grid goes down. Essentially, it offers the best of both off-grid and grid-tied systems. This new type of architecture has inherent cost and reliability advantages over microinverters: it uses fewer critical components than microinverters, its easy installation and connection to the grid allows for reduced installation and maintenance costs and its connection to the module at a cellular level means the performance and cost of the solar module can be optimized. Making affordable financing options available to as many people as possible is the key to stimulating widespread adoption of residential solar. That's why Clean Power Finance offers affordable financing options for qualified installers and homeowners as well as our CPF Tools residential solar sales platform to simplify, streamline and speed up the permitting process. Caught between strong utility-scale project demand, declining solar incentives in distributed generation applications, module over-supply, and significant policy uncertainty, the North American photovoltaic (PV) market is at a crossroads, according to the conclusions of the recently-released NPD Solarbuzz North America PV Markets Quarterly report. Consolidation is on the cards as the US market is undergoing correction and the Chinese wind market is expected to stabilize during the forecast period. Companies have modest expectations of growth for 2011 as major markets have slowed down but are expected to pick up in the second half of year. We have a long way to go before AV, lighting, HVAC, and appliances come together within a home automation network that will work with smart meters and the utilities' back office system to communicate both ways flawlessly, controlling how and when energy is wisely consumed. Strides are being made in each area and we will see more systems coming together for the perfect balance of energy consumption and energy savings.